Tenacious D: The Musical of Destiny. Tenacious D: The Musical of Destiny tells the story of JB and KG. When they meet they decide to form a band, Tenacious D and they go onto chase the magical pick of destiny. Along the way they meet a group of roadies with a strict tour manager as well as Tenacious D’s ultimate groupie. The story is inspired from the 2006 movie Tenacious D in the Pick of Destiny and takes songs from the bands 3 studio albums. The music will therefore be very familiar with Tenacious D’s fans, of which there were clearly a lot in the audience. The show doesn’t take itself too seriously and with a show that is based on the music of Tenacious D this is exactly the right tone to take. Some moments could do with a bit of polish and some fine tuning of some of the script to keep the jokes flowing. The biggest issue with Tenacious D: The Musical of Destiny, was the sound balance. Understandably putting a show on featuring Tenacious D’s music requires a rock band however frequently they overpowered the cast who were not mic’ed. It was especially difficult to hear the cast whenever they turned away from you and with audience on 3 sides this was fairly frequent. This mean that I missed quite a few of the jokes, although luckily as the plot was simplistic I was able to follow this easily. Some Tenacious D songs are massive and require big rock voices to sing them. Unfortunately Angus Townsley playing JB and Sandy Bain playing KG didn’t have the strong rock belt required to do these numbers justice however they were both very natural and enjoyable to watch and clearly understood the humour behind the show and many of Tenacious D’s songs. At times I would have also liked their own interpretation of the character to come through rather than seemingly trying to imitate Jack Black and Kyle Gass. I also particularly enjoyed Rachel Roberston as Sally who went from cute groupie to she devil within a matter of moments! Tenacious D: The Musical of Destiny is a fun show that doesn’t take itself too seriously. Fans of the band need to get themselves down to theSpace @Niddry Street to see this silly but enjoyable show. 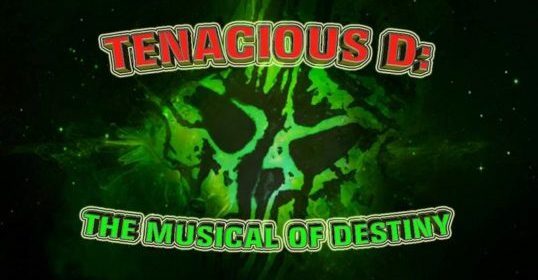 Tenacious D: The Musical of Destiny is running until 18th August at theSpace @ Niddry St – Lower Theatre from 22:15 – 23:30. Visit their page on the Edinburgh Fringe website. If you like this review you might also like my review of Monster In the Hall, Buried- A New Musical and The Worst Little Warehouse in London.